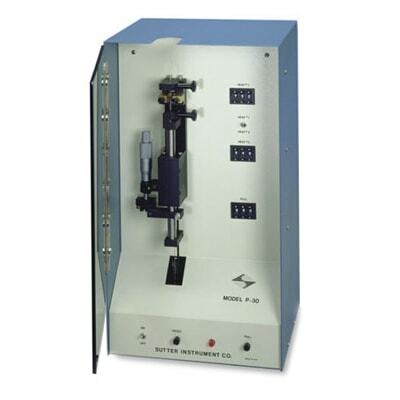 The Model P-30 vertical puller is designed for the fabrication of basic micropipettes and patch-type pipettes. It will pull micropipettes with tip diameters as small as 0.3um and moderate taper lengths (10 to 15mm). By using an included patching attachment, the P-30 will pull the standard double pull patch-type pipette. Used with thin wall glass capillaries, it will generate pipettes or needles suitable for microinjection studies. The P-30 pipette puller is ideal for student laboratories and other situations which call for an economical, reliable pipette pulling device. The P30 is available with either a platinum/iridium or a Nichrome filament. The Nichrome filament is suitable for many applications and is not prone to damage. The Platinum filament is more efficient at heating and cooling, and, although is more prone to damage than the Nichrome filament, the platinum filament is recommended for thick wall and aluminosilicate glass and applications requiring shorter taper lengths. Pulls electrodes with tip diameters down to 0.3um consistently and reliably. A micrometer allows precision reproducibility of trip point settings in producing fine microelectrodes. Full three digit digital controls for accurate setting of heat and pull values. Constant current power supplies for filament and pull solenoid. Enclosed front to reduce variability caused by drafts. Dual (manually) switched heat settings for patch pulling or two different types of micropipettes. All working parts are made from corrosion resistant material. Two heating assemblies available; platinum/iridium (recommended) or Nichrome coil. Built in RFI filter and dual voltage/dual frequency operation. Rubber padded jaws to minimize breakage of capillary tubing. Designed to take up a minimum of bench space.